Fourth Row Center: Film Writings by Jason Bailey: In Theaters: "A Serious Man"
If there’s one thing you can’t accuse the Coen brothers of, it’s selling out. After achieving perhaps their greatest critical success (and multiple Oscars) for No Country for Old Men and boffo box office for their inspired comic follow-up Burn After Reading, they’ve gone and made their most befuddling picture since Barton Fink. A Serious Man is an oddball period black comedy/drama about Jewish suburban angst, populated by a cast of mostly unknown actors. It’s hard to assess whether it works, since what there were going for is anybody’s guess. But it certainly keeps your attention. It begins with a truly peculiar prologue that plays like Fiddler on the Roof by way of Franz Kafka. We then plunge into the story of Larry Gopnik (Michael Stuhlbarg), a college professor and family man whose life is about to fall apart. His bid for tenure is looking shaky, his kids are indifferent to him, his neighbor is encroaching on his property line, his unemployed brother (Richard Kind) is living on his couch, and his wife (Sari Lennick) is about to leave him for family friend Sy Ableman (Fred Melamed). And then there’s the student who seems to be trying to buy a grade. And the angry representative of the Columbia House record club. I’m not even sure where to begin with this one—it has a puzzling feel, and as a viewer, you’re not sure where it’s going or what it’s all going to lead up to. The Coens have rarely indulged their odd, offbeat comic rhythms more freely, and, to be fair, it’s full of the kind of stylized dialogue that they write so beautifully; the first conversation about the divorce is immaculately timed, and that phone call with Columbia House is a masterpiece of circular logic. Those scenes play. So does Stuhlbarg’s frazzled leading performance; he’s a wonderfully reactive actor, and his steadily, subtly irritated double-takes and dialogue reactions (“We can’t know everything,” he is told by one of many rabbis, to which snaps, “It sounds like you don’t know anything!”) are pitch-perfect. Melamed is also impressive as the insufferable Sy. And its final moments play like a spiteful poke in the eye to those who disliked the ambiguity of No Country’s last scene (“You want open-ended?” they all but cackle. “We’ll give you open-ended”). And yet… as enjoyable as it is (particularly for a fan of the filmmakers, which I consider myself to be), it doesn’t coalesce into a cohesive whole, as the Coens’ best films do. The narrative seems at time to be purposefully, spitefully illogical; there’s all kinds of scenes that don’t seem to have much of a compelling reason to exist, aside from the fact that the Coens made a list of stuff they wanted to put into the script. For example, the appearance by Michael Lerner (Oscar-nominated co-star of Barton Fink) is a great one-scene joke, but looking back on the film, I’m not sure why it’s there (aside from providing an easy laugh). Same goes with the subplot about the sultry neighbor, or the scene with Larry and his brother at the beach. It’s a spotty picture, hit and miss; sometimes jaw-droppingly audacious, sometimes bewilderingly esoteric. When you see a film described as “personal” (as many have described this one), it usually means that it’s intensely intimate and autobiographical in its themes. With a movie like A Serious Man, it’s more like the talented, stylish directors don’t care if anyone but them is in on the joke. 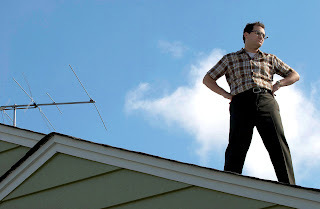 "A Serious Man" is now playing in limited release.